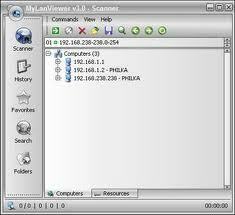 MyLanViewer is a powerful network scanner, file searcher and IP monitor for your home network. It displays your network computers an easy to read, buddy-list style window that provides the machine names, IP addresses, MAC addresses, shared resources and other technical details for each computer. It is able to monitor IP and show notification when states of some computers change. You can also view and access shared folders, terminate user sessions and disable shared resources. Easy to install and use, has friendly and beautiful interface.